Local Red Cross volunteers from Greater NY continue to help those left homeless by the tragic wildfires in California. Thank you to our Red Crossers including Vivian Moy (Public Affairs) and Hannah Simpson (Disability Integration) for providing support. 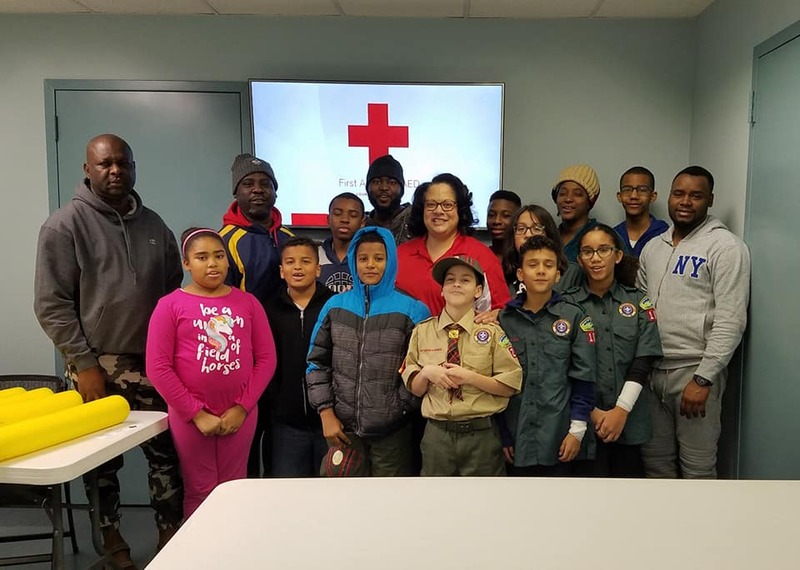 Yesterday, Metro New York North volunteers opened a Reception Center and provided emergency assistance to 15 families (30 adults, 9 children, and 5 dogs) who were displaced by a fire in Yonkers. Red Cross volunteers also provided comfort and care to 9 adults, 5 children, and 1 dog displaced by a fire in Brentwood yesterday. Red Cross volunteers teamed up with partner MIRA USA in Newburgh on Saturday to install free smoke alarms in 60 homes. On Saturday, American Red Cross held a First Aid Merit Badge Training and Certification for Boy Scout Crew 105 and Pack 25 at the Brentwood Public Library. The Red Cross Club at Deer Park High School recently held a fundraiser for hurricane relief during which they raised over $1,300! Keep up the good work Deer Park! Thank you CBS New York and CBS Cares for partnering with the American Red Cross for a holiday card signing event to express gratitude and holiday wishes to our service members. On Monday, we visited NYC Councilman and Red Cross Sound the Alarm partner Robert Holden to record this fire safety message! Local Red Crossers including Cedric Davoren are continuing to deliver hope and help to those affected by Super Typhoon Yutu in the islands of Saipan and Tinian (Northern Mariana Islands). We are actively recruiting for the following volunteer positions: Volunteer Screener, Disaster Action Team Member, Recruitment Support Member, Mass Care Team Member. Apply today at www.redcross.org/volunteer! For more information, please contact recruitmentgny@redcross.org. Dec 3, 4, 7, 9: Red Cross blood drives will take place from 2 to 7 p.m. on Dec 3rd, 4th, and 7th, and from 9 a.m. to 2 p.m. on the 9th at the Greater NY Red Cross building located at 520 West 49th Street, Manhattan. Schedule an appointment to donate today!